Several months ago, I wrote about our pilgrimage to Lehman's in Kidron, Ohio to pick up our wood cook stove. To know that it would fit, we wanted to have the woodstove on hand while building the masonry alcove where it will probably reside for many decades. This is one of those products that I wish was made in the USA, but alas, it's manufactured in Waterford, Ireland. Most of the few remaining wood cook stove manufacturers in North America seem to be focussed on appearance (bling!) more than functionality. This stove is built to cook! When we built the masonry alcove, I included conduit and an electrical box so that we could have electricity and light right at the stove. The light works well for illuminating what would otherwise be a shadowy brick closet. To keep readers oriented, I should mention that this alcove is back-to-back with the Rumford fireplace. The entire alcove, including the floor, had to be complete before I could confidently fit up the stove pipe and fire the stove for the first time. The last place we laid the flagstone flooring was beneath the stove. Because the stove was already sitting in the alcove (and weighs maybe 1500 pounds), I used a car jack to lift the feet far enough off the ground to get the flagstones under them. To the left and right of the stove, I temporarily placed foam insulation to keep the stove from tipping within the alcove. I was glad to get the floor done and put the stove back on the ground, because this was not the most stable (or safe) configuration. Fires are very easy to start in this stove, and although it is not 100.00% air tight, no smoke leaks out of the stove, because the flue is always pulling air from the stove. The cook top is hot enough to cook on within 20 minutes, but the oven takes a bit longer to come up to temperature. With the firebox loaded about 25% full, and the air inlet shut almost all the way down, the oven "wants" to stay about 375 to 425 degrees... wonderful! Open the air inlet too much, or put little pieces of really dry wood in the stove and the oven will shoot up to 600 degrees. Great for self-cleaning, but a little too hot for cookies and pies! Speaking of which, my wife has already cooked a some tasty pies in this oven. In this final picture, I'm impressing my daughter with my culinary skills. She's patiently waiting in the wood storage area for me to finish cooking some frozen corn dogs for her. (A somewhat ironic choice for the first meal from our cook stove?) Home canned green beans are simmering on the cook top (compliments of my wife), and a pie (it was cooked a few days earlier in the pizza oven I think) is in the warming closet at the top of the oven. Until we fired it up for the first time, I never realized how much cooking area these stoves have. You can place a pan (or your hand!) anywhere on the large stovetop and cook. A grocery bag full of wood is plenty enough to cook an entire meal with this stove. Unlike some stoves, this one is not designed to heat a house - in fact, it's so well insulated that you can safely place your hand on the side or back of the stove after it's been fired for the entire day. (But don't try touching the front doors or the cook top!) We have not yet figured out how to keep a fire going all night in the stove. The wood always burns up some time in the middle of the night. I suspect our flue has too much draft, because the fires burn hot even when the integral damper and air controls are shut all the way down. But, so far, we're really happy with the stove. It's another one of those products that has exceeded our expectations. For almost two years now, we've had a piece of marine plywood (with screen door hinges on it) serving as our back door. That poor piece of plywood took a beating as we carried rocks, mortar, timbers and whatever else we needed into the house through that opening. Now that most of the "rough" construction is finished on the inside of the house, we decided that it was time to hang our real back door. A woodworking friend of ours made this white oak door for us from scratch over a year ago (hmmm... at least someone was on schedule!). Then my wife soldered the diamond shaped pieces of glass together to form the window panes. We had a glass shop seal each of her custom window panes between two pieces of glass, so her work will be well protected and the door will be more energy efficient, while still maintaining the "old world/craftsman" look we were going for on the back of the house. Because so much of everyone else's time was invested in this door, I was nervous drilling and mortising the holes for the door hardware. I spent $30 to buy new drill bits for this job. Incidentally, because the door opening is flanked by vertical (green) white oak 8"x8" timbers that have shrunk to 7.5"x7.5", the actual dimensions of the opening have changed. I had to fudge the striker plate for the door latches, as well as the gaskets at the door jambs to get everything to shut properly. But man does this door sound good when you shut it. "Clunk." No rattle or vibration whatsoever. It's even fun to slam (the door has ball bearing hinges) - just make sure no one else is on the other side. The second photo shows the inside of the door from our mud room. When this picture was taken, we were laying the slate tiles in the mudroom. (the orange and white dots on the floor are temporary tile spacers) As with the upstairs bathroom, these slate tiles are made from the scrapped, culled, and broken slates that were left over from our roofing project. Better than using them for backfill! Currently, we have two computers, a refrigerator, lots of lights, a 220 air compressor, random power tools, a small window air conditioner, and a deep freezer running flawlessly on the system. (We have expanded the solar array from 1250 Watts to 5000 Watts as we've added appliances.) At present, our inverters can produce 7200 watts, but soon I'll be expanding the inverter system's capacity to 14,400 watts to accommodate the most ambitious off-grid appliance yet... but first some background. When my wife and I were just in the planning stages for our new house, I was insistent that it should be off grid. I wanted to produce all of our own power and not rely on public utilities. I realized that once you convert the biggest electrical pigs in the household (furnaces, electric ranges, water heaters, and clothes dryers) to gas or wood, then the electrical requirements for most homes can be met with an array of solar panels equivalent in price to a new SUV. I conveniently left air conditioning out of the equation, but my wife started asking about air conditioning, so I thought I had better look into it. One wild, but no so practical, idea I had was to buy a tractor-trailer refrigeration unit on ebay and run home grown soybean oil in it (in place of diesel) to cool the house. Hmmmm. I got bogged down at the "squeeze/press the soybeans and filter the oil" stage. I'm an eternal optimist, but that idea was starting to look doubtful even to me. So I continued to dodge and dismiss the air conditioning question for as long as I could. This only aroused my wife's suspicions that I had no viable solution. The solution, I realized, was to compromise on some other aspect of the house (sorry kids, there went the pool! ), increase the eventual size of the solar array to 10,000 Watts, and find the most efficient geothermal heat pump in existence. 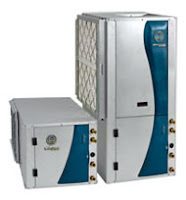 I decided to go with the two speed Envision series from Water Furnace. An on-the-grid friend of ours had two Water Furnace systems installed in his timber frame ten years ago and he loves them. (I think his are single speed models.) He introduced us to his installer (a man who has put in several hundred of these systems) and we hit it off. I don't just trust he can do the job - I like the way he thinks. The systems have a COP (coefficient of performance) that can approach 5 under ideal conditions. 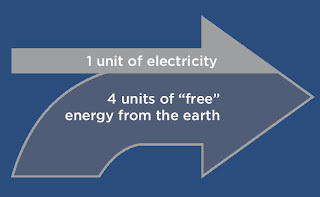 In other words, for every 1 unit of electricity they consume, they can add or remove 5 units of heat. For instance, 2 Kw of electricity could yield 10 Kw of heat (equivalent to 34,000 BTU/hr). Our house will have two, 2 ton units. Under full power, these units will consume a combined total of 4 Kilowatts of electricity, which is within the capability of our solar array when the sun is shining. On cloudy days we can run at least one of the units at the low power setting so long as we have 1200 watts of available sun power. In fact, one of the units (the one dedicated to the bedrooms), can run for 8 hours at night and use only 25% of the KwHrs that our batteries can store. I doubt I'll be able to keep the house at 68 degrees when its 105 degrees outside, but I'm confident that we'll be able to keep the house in the low to mid seventies in the summer. More importantly, these units will reduce the extreme humidity we see here in Kentucky. Make no mistake, the primary purpose of installing these geothermal heat pumps in our house is to provide air conditioning, but we can and will use them to provide heat for the house when the sun is shining and our batteries are full (like today!!). I won't count on them for heat, but when it is available, it'll be that much less wood I'll have to burn! Fifteen years ago, our installer put these systems in exclusively with ground loops buried in trenches (that he dug with his own back hoe). He has since become convinced that drilled well systems are superior, and installs almost all of his systems in wells now (he farms out the drilling process). 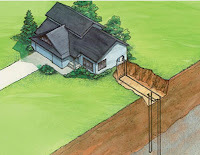 He convinced me that wells are superior (especially for our clay soil), so we're having ours installed in four wells, similar to this picture from Water Furnace's web site. If we can hit the ground water table, the system will work much better, so he recommended that we go to 200 feet instead of 150 feet, due to our location on a hill. Regardless of whether we hit water, the extra loop length can only improve the efficiency of the system. I'll be updating the blog with pictures of the installation. I also plan to develop some automated way to turn the ground source heat pumps on and off, depending on the availability of sun and the temperature of the house. For instance, if the sun is shining and the batteries are charged, the system could go ahead and lower the thermostat from 74 to 70 (in air conditioning mode) in order to bank some of the solar energy. When I get that working, I'll describe it on the blog. But first, I must go add two inverters to the system, so I'll have more than enough current to start the compressors in the heat pumps when they're installed. I just started another blog to share our experience of raising beef cattle on our farm. 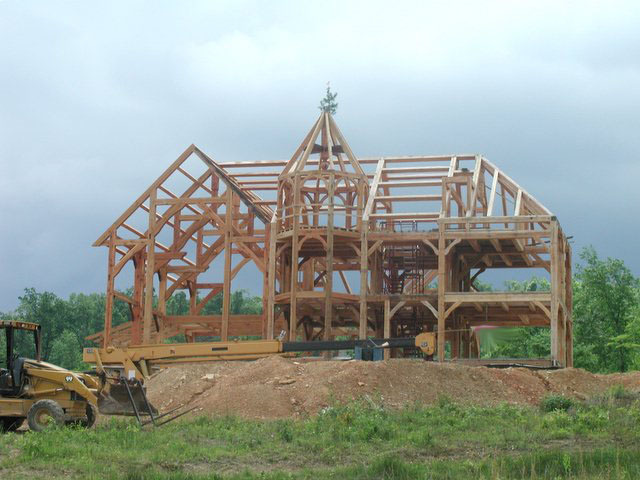 If you're strictly interested in home building or timber framing, then don't waste your time at my new blog. (For that matter, why are you wasting your time at this blog?!) 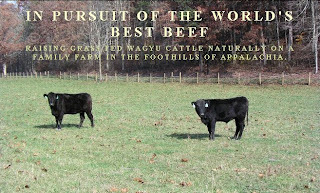 Seriously, if you're into sustainable farming or if you like the taste of good beef, then you might want to check it out! The short version of the story is that we've been raising cattle on this farm in between building this house. Or is it the other way around? In any case, this house and the cattle have been permanent fixtures in my life everyday for several years and I thought it was time to give them some internet exposure. :) I prefer to sell the beef directly to consumers instead of at the stockyards, and so I've been focused on the quality of the meat instead of the weight of the animals. About a year ago I started transitioning our herd (which averages 40 animals) from Angus-cross-Charolais and Angus-cross-Limousine cattle to Wagyu, which means "Japanese Cow." The beef from these cattle, when raised in the Kobe prefecture of Japan, is known as Kobe Beef... the best in the world. Legend has it that these cattle are fed beer and massaged in Japan to increase their appetite for corn and rice. I might share a case of oldmilwaukee with them, but they'd better not rely on me for a massage. Massages and carbohydrate laden diets notwithstanding, the animals are genetically predisposed to produce tender meat with lots of marbling and even produce more of the "healthy fat" (is that an oxymoron or what? ), or so the story goes. I'm convinced its mostly true, so I've invested my time and money into making it happen on our farm. We've already had 3 Wagyu calves born on the farm, so our first Kobe-style beef will be available for sale in about a year!